The Great White Way is a nickname for a section of Broadway in the Midtown section of New York City, specifically the portion that encompasses the Theatre District, between 42nd and 53rd Streets. Nearly a mile of Broadway was illuminated in 1880 by Brush arc lamps, making it among the first electrically lighted streets in the United States. The headline "Found on the Great White Way" appeared in the February 3, 1902, edition of the New York Evening Telegram. The journalistic sobriquet was inspired by the millions of lights on theatre marquees and billboard advertisements that illuminate the area, especially around Times Square. Welcome to GreatWhiteWay.com, your essential theatre partner! With dozens of Broadway and Off-Broadway shows performing each night, choosing the right show for your group can be challenging. 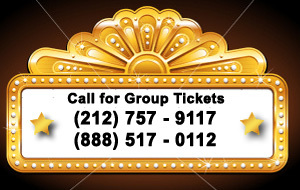 Our concierge group ticket service makes booking theatre tickets easy! Here at GreatWhiteWay.com, your satisfaction is our primary goal. Simply call (888) 517-0112 to speak to one of our personal ticket specialists. They will be with you every step of the way, ensuring your group finds the right show at the right price. Let's get started... call (888) 517-0112 to get the best theatre experience New York City has to offer!